A few months back I was offered a product to try out and review by Gobi Gear called the Hoboroll. 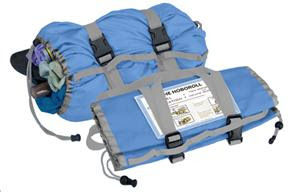 The Hoboroll is “the first luggage organizer that provides compression of items as well as multiple storage compartments”. I’m always looking for ways to make travel easier and organizing things simpler so I was happy to accept the offer. Can be used as a stand alone item thanks to the shoulder strap or be placed inside a larger bag. I usually travel with a backpack and roll my clothes to organize them and save space. 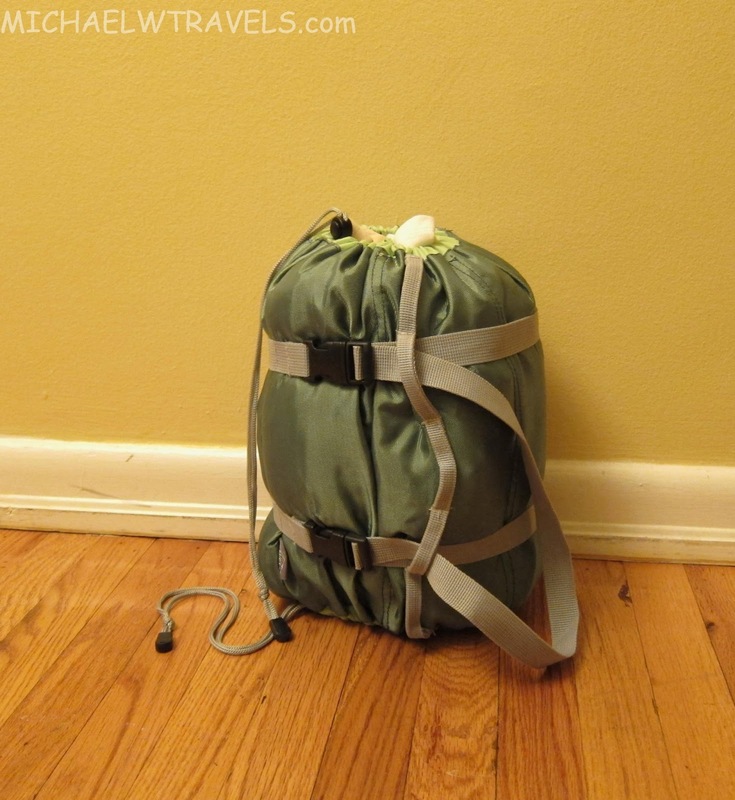 When I read about the Hoboroll it sounded like a great tool to help organize my stuff. Can be used as a pull toy too! The Hoboroll has openings on both sides so clothes never get lost at the bottom. I found it easy to open the adjustable strings on either side to find what I was looking for. I also liked how it has five compartments. The problem is that each compartment is relatively small. I first tested out the Hoboroll on a quick overnight trip. I found it to be extremely useful. All of my things fit inside with room to spare. I placed a couple of shirts, shorts, underwear/ socks and electronics chargers inside. I then placed the Hoboroll inside my day pack (26L) and it filled up most of the space. The nice part was pulling out the HR and opening one side. I was then able to take out things as needed, keeping organized and more or less never unpacking my things. Kim was also excited to give the Hoboroll a try. For a long weekend trip she was able to pack her tops, pajamas, as well as Lucas’ outfits and sleepwear for about 3 days. She found the pockets too small for her jeans but the perfect size for her shirts and Lucas’ clothes. When my trip to Russia came around I tried packing all of my shirts inside the HR. This was pretty much a waste of time since I could only get a couple of shirts in each compartment. I didn’t think it made sense to pack my smaller items like socks and underwear inside because they fit into small spaces in my large backpacks (60L or 75L). So for our week long trip to Russia the HR was used for all of Lucas’ tiny clothes. Being so small they are pretty hard to roll. On previous long trips (7+ days), we packed like items in ziplock style bags (from Ikea) and tried to squeeze out as much as air as possible. This worked out OK in the past but after opening/closing/squeezing these bags repeatedly some of them broke. Also they still took up a lot of space. 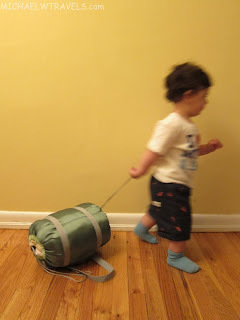 We found that the Hoboroll worked extremely well for Lucas’s clothes. 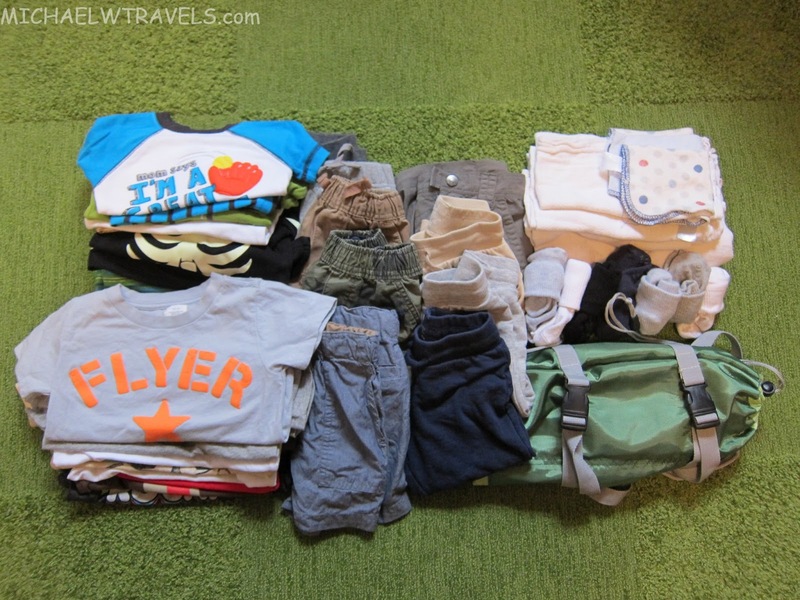 We were able to fit the bulk of Lucas’ clothes for a 10 day trip inside. Once compressed, the HR was really pretty compact. We still needed a large ziplock bag or two for other, bulkier things (blankets, burp clothes, outerwear) that Lucas needed for our trip to Russia in the winter. Every day when we went to dress Lucas it was nice to have his clothes all in one place. Rather than dig through multiple bags, everything we needed for him was right at our fingertips! Towards the end of our trip, we emptied out the Hoboroll and then filled it up with his dirty clothes. When we got home there was no need to sort out Lucas’ clothes from ours, it was all in one place. We’ll be leaving for our early Summer trip in about 10 days and decided to see if we could fit all of clothes we will need for Lucas into the Hoboroll. We’ll be away for 11 days including transit time. The photo below shows enough clothes for that amount of time. If you’re looking for a way to organize your things, and save space in your luggage for a short trip I’d definitely recommend the Hoboroll. If you travel with a child, this is where I feel you’ll get really great use from the product. The Hoboroll costs $28.00 and is currently on sale for $22.99. I feel that at $28.00 it is a very fair price. The sale makes it that much better of a value! Find out more about the Hoboroll and purchase one here. Disclosure of Material Connection: I received the Hoboroll for free from Gobi Gear as coordinated by Deep Creek PR an (Outdoor Industry Public Relations Company) in consideration for review publication.